Cafe Murano is the latest venture by Michelin starred chef Angela Hartnett. Located on 33 St James Street, it occupies a site that has played host to a number of restaurants including the original Pétrus by Marcus Wareing, Fleur, Fiore, and most recently Brasserie St Jacques. Far from being a café, Cafe Murano is a contemporary and stylish restaurant serving modern accomplished Italian food. Cafe Murano’s menu by Head Chef Sam Williams starts with cicheti (tapas) and then moves onto antipastas, primi plates of pastas and secondi mains. The restaurant seats about 80 and includes a long bar area where guests can also tap into a small bar menu. As Cafe Murano is located right on the fringe of the West End, there’s also a set lunch and theatre menu of 2 courses for £18 and 3 courses for £22. It’s an elegantly decorated restaurant, and given that it’s located on a prime piece of real estate, Cafe Murano has done a great job of balancing smartness with a sense of relaxed refinement. There isn’t an ounce of stuffiness in the restaurant. Take our waiter – he might have been wearing a smart shirt, but he also donned a pair of jeans. 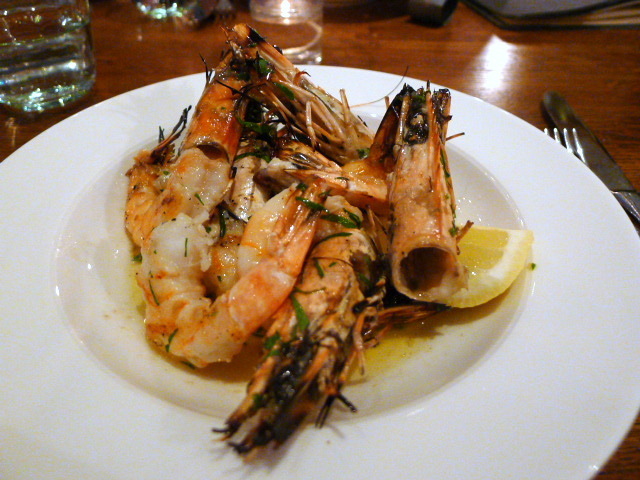 We started with a generous portion of king prawns with garlic and parsley (£15), six pieces of tasty prawns that were really nicely cooked. Sautéed in butter and olive oil with a well-judged amount of garlic and parsley, this proved to be a lovely dish. Warm octopus with chickpeas and gem lettuce (£9.50) came with a tomato-based sauce of onions, carrots, fennel seeds and the cooking stock of the octopus which was delicate and moreish. 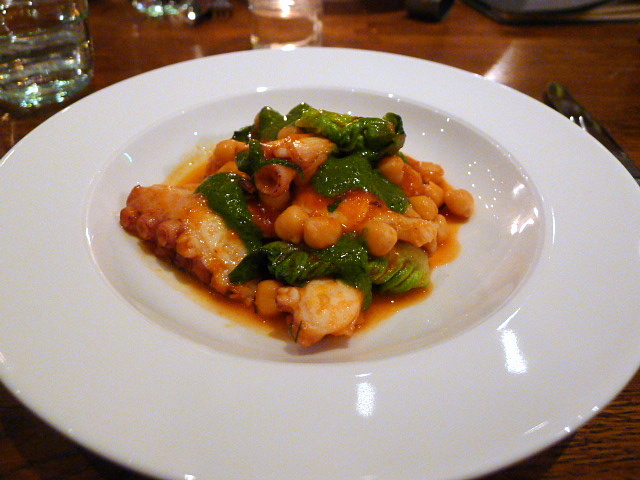 The star of the dish, the octopus, was extremely tender, but unfortunately it was also a little bland. To the primi plates, and a starter portion of pasta – a morel, asparagus and wild garlic gnocchi (small – £11) was really nicely done. 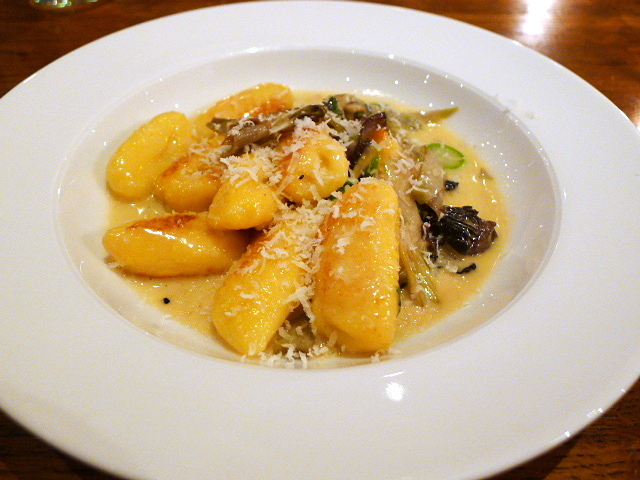 The gnocchi had a great texture and was soft without being too doughy. The gnocchi had also been browned individually, further enhancing its flavour. The morels were yum, and the asparagus still held onto their crunchiness. The sauce, a buttery creamy concoction was tasty, but incredibly rich from the very heavy use of butter. 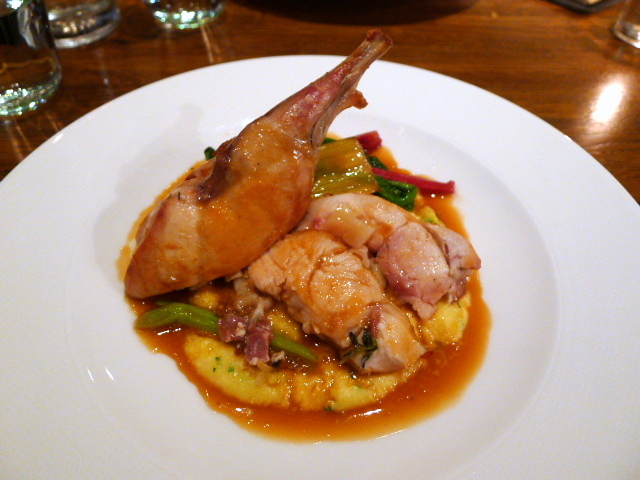 A main of rabbit leg with wet polenta, ruby chard and pancetta (£19) was a gorgeous dish and wonderfully accomplished. The rabbit had been roasted two ways, as leg on the bone and also deboned and rolled with potato and pancetta. The rabbit was stunningly moist and tender, and the use of pancetta was a nice inclusion if a little salty. The accompanying jus was excellent – delicious, rustic and satisfying. It worked wonderfully with the rabbit and the creamy polenta was a great addition to the dish as it went a long way in mopping up the yummy sauce. 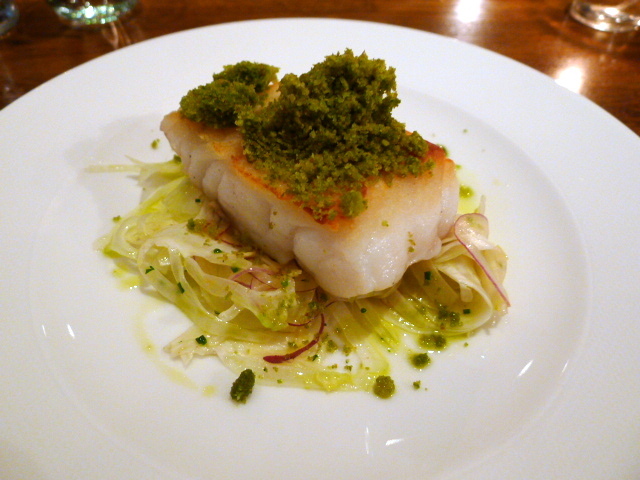 A piece of cod came on a base of fennel with a basil crumb topping (£17.50). You couldn’t fault the cooking of the fish as it was moist and flakey, and the fennel had a great bite to it with the basil crumbs being crunchy. But with no sauce and little acidity, the dish as a whole was rather dull. 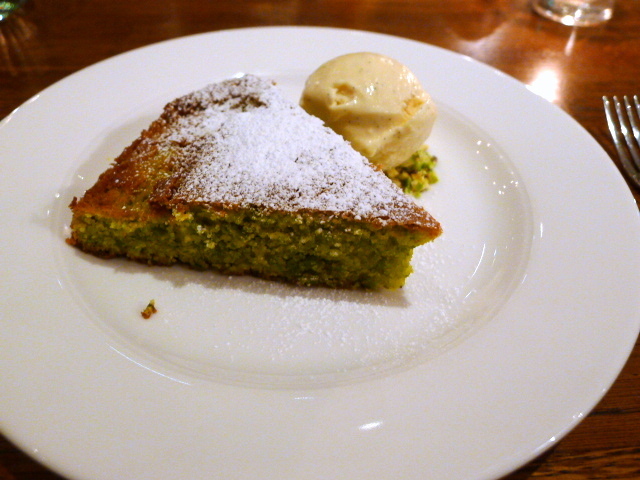 A pistachio and olive oil cake with vanilla ice cream (£7) was wonderfully moist and moreish. The surface of the cake was slightly crunchy which heightened the enjoyment of it. We really enjoyed our meal at Cafe Murano even if there were a few minor areas that we thought could have been better. Not only was the food delicious, the service was also excellent – smart yet unpretentious. Cafe Murano made for a lovely chilled out dining experience. Prices were also reasonable. This is how a restaurant should be run. Prices: £30 to £53 for three courses, excludes drinks and service. We visited Murano a couple of years ago and had heard good things about Cafe Murano, your review has made our decision to book for dinner so much easier, thank you. A wonderfully written review but mouth watering pictures. Glad I could be of help. Enjoy!